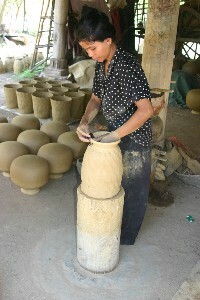 The mission of Khmer Artisan Project is to train and educate Cambodia Artisans in modern and more efficient techniques in pottery manufacturing, skills training in entrepreneurship and marketing, and microfinance management. These skills will give the opportunity for increased sustainable incomes for the Artisans of Cambodia. Bruce is back in Cambodia! Be sure to check out his blog.